Though not the southernmost of the islands of the Caribbean sea, swung south of the great curve of the archipelago there’s a real sense that the Caribbean ends with Grenada (at least, for those of us with a northern hemisphere perspective). After all, Trinidad and Tobago are a significant detour when there’s over 150 kilometres of open sea between Grenada and the mainland of South America. So why visit the tail end of the Caribbean? Because like the cinnamon, nutmeg and ginger plants that make this the ‘Spice Isle’ of the Caribbean, even the tip can contain the most incredible flavours. Alike to much of the Caribbean, tourism is a major economical cornerstone in Grenada. You (and you money!) are very welcome there, and the local government and businesses have built an enviable infrastructure that will make your stay very pleasant indeed. In fact, there are very few tips I can give that don’t involve simply getting on with your holiday and enjoying your stay! Basic Tips – And Why Grenada Is Hardly Any Hassle At All! English speakers will be able to communicate with most people on the island: British English is the official standard, and the Creole spoken by the locals is relatively easy for outsiders to understand. Locals will expect some tourists to misunderstand, but so long as you treat them respectfully, they’ll often be very helpful. The water in Grenada is chlorinated and safe to drink. Staying hydrated is one of the island’s few health hazards, so take bottled water when you’re out and about! Taxis, Buses, Water Taxis and Car Rentals are all available. The roads are quite safe, though some less travelled examples are quite narrow. The island’s official currency is the East Caribbean Dollar. It can also be used on many neighbouring islands, which can be handy if you want to island hop! The Banks will deal with British, European and American exchanges. You can also use the ATMs at these banks for such transactions. Obviously, the exchange rate fluctuates, so remember to look before going! As a former British colony, Grenada uses 220 volt, 50hz: the same as the United Kingdom. It uses the same three prong plugs too, so British visitors will be right at home! Visitors from the United States and elsewhere will have significantly more hassle: transformers, adaptors and converters are the order the day. Places to Go – See the Best of the Island! Is there an island in the Caribbean that isn’t beautiful? I don’t think I’ve heard of it. The southern beaches on the island are the most popular, lined with resorts. However, Grenada understands its natural resources and refuses to let tall building overshadow these fantastic beaches. Head north for a more quiet and secluded beach-life: Levara beach is a great start. The accompanying national park is lush with vegetation and many animal species. 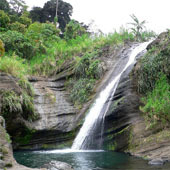 The waterfalls of Grenada are also significant. There are four in total: Annadale, Concord, Seven Sisters and Victoria falls. They’re not readily accessible, but hiking through the forest to get to them is just part of the fun! Tourism may be important to Grenada, but its history is well represented in several fantastic landmarks. Three historic forts tell the story of Grenada’s early colonial past (when the French and British warred over the island, which was very valuable strategically). The Spice Market in St. George’s proves that the island’s agricultural life is alive and well, and most adults will want to take a trip to the Grenada Sugar Factory to sample the rum on offer! When the sun goes down on Grenada, things don’t grind to a halt. The clubs are reasonably priced and full of regional flavour: Fantazia in St George’s is popular, whilst Karma is in the same town and large enough to let you live it large. Whilst Granada caters to the nightlifers, it’s also noted for being a bit more versatile for those who prefer something more relaxing: bars like the Beachside Terrace keep things a little more subdued, and Families are always welcome at the crab-races held at the Flamboyant Hotel ever Monday. Stephen Wood writes for Tropical Sky Ireland, a tour operator whose offers all inclusive holidays include Grenada holidays!